BMTE presents a staged reading of Almost, Maine by John Cariani as a special Valentines Day performance. Admission is Free, 8pm, Saturday, February 16, 2008 at Stuart’s Opera House, Nelsonville, OH. 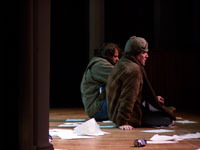 Almost, Maine is a romantic comedy that began performances in New York in December 2005 at the Daryl Roth Theatre. The show received a wide variety of rave notices for its funny, touching look at life in the small, far northern town of Almost, Maine. Audiences flocked to see this show, with its hilarious and heartbreaking stories of love in the time of frostbite. Posted in Uncategorized on February 18, 2008 by Erik Ramsey.